1. Does the engine have carb heat? 2. Can cabin heat be fitted? Yes, we would suggest using the same arrangement as on the carb heat, which gives a 70 F temp rise at the carb. Also, the composite structure insulates well, and the canopy greenhouse effect coupled with body heat keeps the pilot comfortable down to about 10 F without the cabin heater. 3. What temperature does the shop have to be at for fiberglass layups? Ideally, 65 F to 85 F.
4. How do I get my Quickie to the Airport? e. Move to airport before start of	construction. 5. What is the TBO on the engine? We now have over 175 hours on N77Q in addition to much more time on the test stand. We have seen nothing that would indicate the engine won't go the 800-1000 hours between major overhaul that other industrial users of the engine obtain in applications like electric welders, concrete coring machines, etc. 6. Can the Quickie operate off Grass Runways? Yes, See this newsletter's section on "THE FLIGHT HOME: GRASS RUNWAY OPERATION". 7. What are the "g" limits? We call the Quickie a Utility category aircraft, which means 4.4g positive. 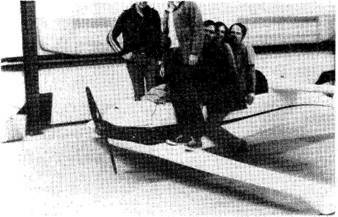 The design limits on the wings are l2g plus; the canard was tested to l2g and the main wing to 6.8g with no sign of failure. 8. Is the Quickie Aerobatic? Well, it won't spin! It should have the same capability to loop and roll that a Cessna 150 does. 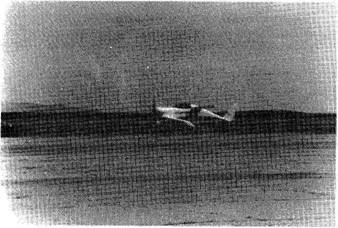 Since we canât consider a C-150 to be really aerobatic, we donât call the Quickie aerobatic. 9. How big a pilot will fit in a Quickie? Before Oshkosh, we considered 6'-5" and 210 Ibs to be the limit; but then we fit a 6'6" and 220 lb guy in who wanted a Quickie so bad that he was dieting (and already had lost 15 lbs). He was comfortable enough that he ran right in to our booth and bought an aircraft. 10. Will the Continental A-65 engine fit? Only if you want your Quickie to set on its nose in the hanger rather than fly! The A-65 is 100 lb heavier and that is out of the question. 11. How about a sawed in half VW? We talked to Van's Aircraft, which has been developing an aircraft around that engine for three years. He states that it is not an aircraft engine, and will require much work, money, and talent to become one. We concur; we have never been impressed with the VW engine for aircraft use. 12. When is the two-place going to fly? We are not developing a two-place. Our builders deserve our full attention for at least the next year. The Quickie took three years to develop. Therefore, those of you who are holding off on building a Quickie because you hope we develop a two-place have a very long wait ahead! 13. I've never built an aircraft before; can I build a Quickie? We firmly believe that the Quickie is the easiest-to-build real airplane in existence. There is no reason why anyone with a basic determination and willingness to learn should not be able to complete and fly his Quickie. 14. Is the 400 hour construction time for a professional aircraft builder? No! It represents the average individual. Who says a Quickie only carries one person? (Note the barely visible 400 lb of lead shot bags used for this Landing Gear Test.) Actually, for all of you who want a two-place Quickie, we wanted to show you a picture of our six-place version under development. Wayne Thomas from Mechanics Illustrated magazine touches down after his flight in the Quickie.